*Don’t try to read the word in brackets. CAHTEXHNK doesn’t mean anything. It’s a funny way of writing a Russian word САНТЕХНИК with Latin letters. (Russian alphabet is different from English.) Can you tell the difference between the words? САНТЕХНИК (pronounced “san’tekhnik”) means PLUMBER in Russian. And the club members began upgrading all the house equipment at once. It turned out that besides the Bears only Cathy Tea has the required handiness level 2+. So, it’s almost family club. So, while Bears are upgrading equipment, Lilly and Cathy are making viruses and hacking into Simland defence computers. Btw, if you have any problems, dial up (123)-456-78-90 – PlumBears Ltd are always at your service. Need repairs? Call PlumBears! Now Freddy is the Leader of the Pack. The Bears are snowed under with work. So numerous suggestions to spend time in some bar or a cafe were declined politely. But when Baby invited them to the Bear Night at the Bar, they couldn’t resist. Sindy! What are you doing on another’s husband’s shoulder? How about your homework? Have you done it? One more child is hanging around no one knows where. What are her parents thinking of? There are a lot of bears in the bar. Suddenly, we saw an alien. The mad idea flashed across my mind. The wizard Testingcheats was called, then – Master Cas-Fulleditmode. We managed to persuade him to help us. In no time our friend Aellitta was making drinks in the bar and her friend Sima was chatting with Grace. Having heard about such fun, the other PlumBears joined. Freddy has discovered that Aellitta Zed is an alien! That was so hard to see. Freddy was so shocked, that ordered a drink in the bar. He was having stings of conscience for three hours after that. Ghost Night! It can’t be missed! Grace and Junior went to Windenburg again. Cassandra! We didn’t know you’re dead! Junior and Grace chatted with old friends and made new ones. Astra made a revolution in the Garden Gnomes. She gave the overthrown leader Moira an aromatherapy massage. And Astra is also the Leader of the Pack. New members were invited to the club. 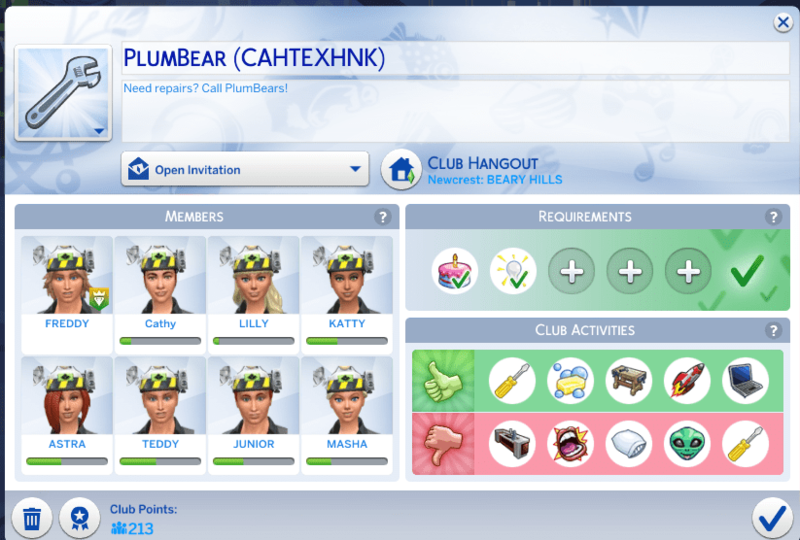 Posted on May 17, 2016 by chealsycatPosted in Goldilocks and Bears (Sim fairy tale)Tagged #Goldilocks and Bears, #Sims 4, bears, Goldilocks, Sims.